there is a little rain and some melting of the glaciers in this part of Antarctica. Antarctic, common name on the surrounding land- and oceanareas on the South Pole. and about the 50th towards the Atlantic and Indian Oceans. 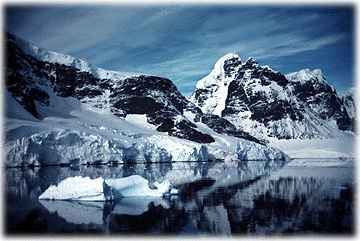 The Antarctic is covered by an Icecap up to 4.200m thickness, averaging 1.500 to 2.000 m asl. On the Pole, snow lies at 2.800 m asl. The highest mountains is Massif Vinson; 5139 m asl in Ellsworth Mountains area. 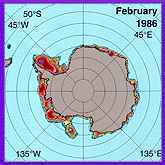 Satellite images showing the changes in Antarctic sea ice in 1986. The reds and purples are the areas of most dense sea ice concentration. to get rid of ice in a polar setting! Lots of ice are now disapperaring from the South Pole area, byt exactly how much is melting? Some calculations say that so far as much as 3.275 square-kilometers have dissappered. 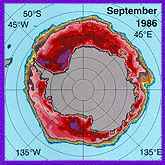 That equals 720 cubic-kilometers or 0,0024% of all the ice in Antarctic. there just isn't that much to go for. And now the North Pole is also getting into the matter. to present sea level. The East Antarctic Ice Sheet sits on bedrock close to, or above, sea level. 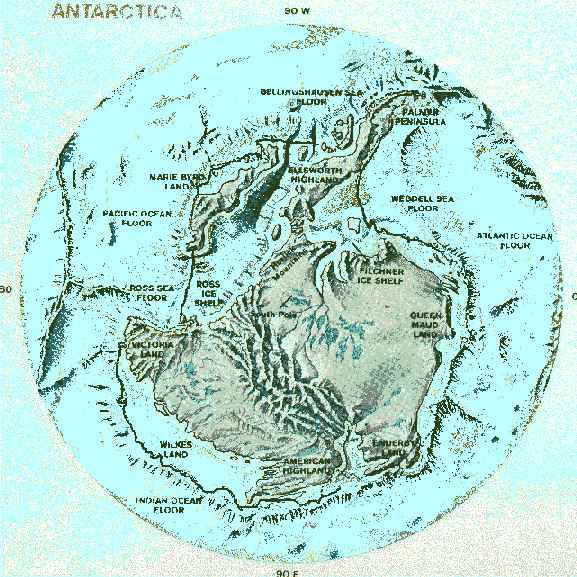 Map showing what is really land on the South Pole. A black line sorrounding the mainaland shows what is 'the pole' today, where ice makes up most of the area.